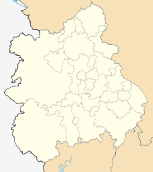 The district was formed under the Local Government Act 1972, on 1 April 1974, as a merger of Bewdley and Kidderminster municipal boroughs, Stourport-on-Severn Urban District Council and Kidderminster Rural District Council. Since 2011, Wyre Forest has formed part of the Greater Birmingham & Solihull Local Enterprise Partnership along with neighbouring authorities Birmingham, Bromsgrove, Cannock Chase, East Staffordshire, Lichfield, Redditch, Solihull and Tamworth. The Wyre Forest parliamentary constituency, which covers most of the district, is represented by the Conservative MP Mark Garnier. He has held the seat since the 2010 general election, when he gained it from Richard Taylor of Health Concern, who had held the seat from 2001 to 2010. There are five secondary schools within the district. ^ "New £10.5m Wyre Forest District Council HQ to open its doors". The Shuttle. 28 September 2012. Retrieved 23 May 2015. ^ Klensch, Sabine (7 May 2010). "General election 2010: Tories gain Wyre Forest from independent Taylor". politics.co.uk. Retrieved 23 April 2015. ^ "Wyre Forest Tories tighten grip on council". Evesham Journal. 10 June 2015. Retrieved 10 June 2015. Official District Council web site. This page was last edited on 8 February 2019, at 12:53 (UTC).